Lease Vs Buy A Car Guide, Should You Lease Or Finance? To lease or to buy? This is the question everyone is faced with when it comes time to shop for a new ride. Of course, depending on who you talk to, you’ll get a completely different opinion on which option is best and why. There are people who have always bought cars and always will. There are people who have always leased and always will. Then there are those who will buy or lease depending on the market conditions and whichever option at the time offers the best financial advantage. So, which is the best choice? 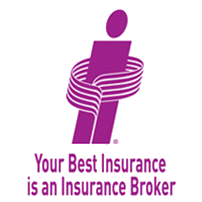 There really is no clear cut answer, and it comes down to your specific driving needs and financial situation. But this doesn’t mean we’re not going to help you make the best possible decision for you. To help you work through the question of buying or leasing, we’ve put together some great information about the costs of having a car, financial considerations, and the pros and cons of each option. First, let’s take a look at the current driving situation in Canada. Most people believe that having a car is a must. An overwhelming 86% of people in the U.S. think that cars are a necessity. If we had polling information on people’s opinions about the necessity for having a car in Canada, we’re pretty sure that the percentages would be similar. Running errands – groceries, going to the gym, etc. Plus, the size and vastness of Canada makes it challenging for many Canadians to travel or get around without having a car, especially those who live in smaller towns and rural areas. Outside of large cities like Toronto, Montreal, and Vancouver, public transportation systems are not as advanced, placing more need on having a car to get around. There Is Almost 1 Registered Vehicle For Canadian : There are 32.5 million registered vehicles in Canada, and with a population of 35.6 million, that is 0.9 registered vehicles per person. 11.4 Million Registered Vehicles In Ontario : In Ontario, the ratio is a bit lower where there are 11. 4 million registered vehicles and a population 13.7 million, for 0.8 registered vehicles per person. The ratio is likely lower because many Toronto residents don’t have a car and use public transit. 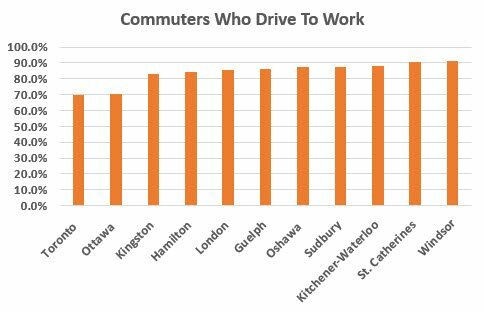 11 Million Canadians Drive To Work : Twice every working day, about 15.4 million people commute to work. Of those commuters, 11 million people (74%) drove a vehicle to work. That’s a lot of cars and a lot of traffic! The average cost of a new car in Canada in 2014 was $33,000. The average monthly car loan payment is $570. The average monthly lease payment is $490. Canadian drivers are also spending a large portion of their income on cars. The average Canadian’s income is $49,000 and the costs of car loan or lease can represent almost 20% of that income. That doesn’t even include the costs for insurance or gas, which makes the total cost to drive even more. We’ve all heard about being house poor, but it seems as though many Canadians could become “vehicle poor” if they fail to make a smart vehicle choice. This brings us back to the all-important question – Should you buy or lease? Let’s compare the options in greater detail. Before you can make a determination about leasing or buying, you need to understand your driving needs and habits and, more importantly, which option makes the most financial sense. What is more important – the monthly payment or total cost of the vehicle? How will I pay for the car – cash on hand? Financing? Line of credit? Do I plan to make a down payment? Do I want/need a new car every few years? Do I want something to trade in on my next vehicle? Even though choosing a car can be a very emotional decision, you need to make rational decision, especially when it comes to the financials. Once you’ve figured out what you can afford, you need to consider the vehicle features you want/need and how you will use the vehicle. How would you like to keep your car? How many kilometers do you drive annually? Do you take care of your car and maintain it regularly? Do you want to customize your vehicle? Is it important for you to have equity in your car? Car ownership is expensive and drivers continually search for ways to reduce those costs. For some people, leasing is one significant way to reduce the monthly cost of operating a car. Did you know that 1 in 4 people make the choice to lease a car over buying a car? Studies show that people who lease are as satisfied as those who finance a car purchase. 66% of people who lease a car were very satisfied compared with 69% who were very satisfied with financing or buying a car. When you lease a car, you are entering an agreement with a leasing company that gives you the right to drive the vehicle of your choice. Leasing is similar to a long-term rental. Your payments don’t build equity like a car loan and payments do. When you lease, you can still negotiate terms of the deal such as the length of the lease, your monthly payment, the rate of interest, amount of kilometers you can drive for the duration of the lease (known as wear and tear) and a buyout price (residual value) at the end of the lease – in the event that you decide to buy the car. You Want To Drive A New Vehicle : Leasing makes it more affordable to drive a new car. Lower monthly payments allow drivers to drive a car that they may not be able to drive if they had to buy or finance it. 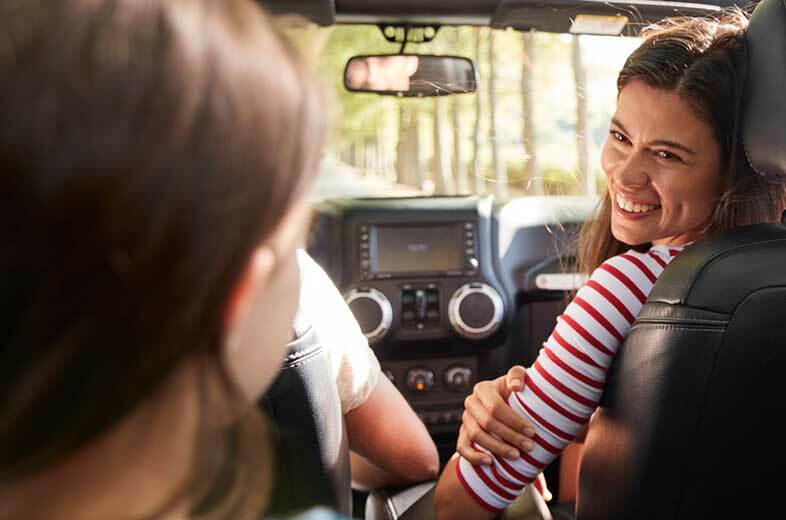 You Like Getting A New Car Every Couple Of Years : If you like driving a car with the latest features and technology, leasing is a great way to get a new car every 2-4 years. You Want Lower Monthly Payments : Many people need to watch their bottom line and keep monthly expenses as low as possible. Leasing allows people to drive a new car for less than financing a new car. You Don’t Put A Lot Of Kilometers On The Car : If you don’t drive a lot, you don’t have to worry about kilometer limits on a lease. Owning gives drivers much more flexibility with how they use their car and what they do to it. Buying a car allows you to make modifications, drive it as you please and you can also use it as an asset. If you have the resources, you can pay with cash – an option that gives you good negotiation power. However, most people take out a car loan. 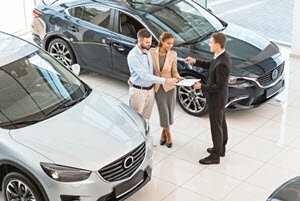 You can secure a loan through the car dealership you are working with, but you can also get a loan with your bank, a lending company or even use a personal line of credit. So you have options. When purchasing a vehicle using a loan, your lender is the one who owns the car until you finish paying off your car loan. You can negotiate the term of the loan, the interest rate and the monthly payment with your financer. You Drive A Lot : When you own your car, you don’t need to worry about the distance you drive. With a lease, there are mileage limits and financial penalties if you exceed them. You Plan To Keep The Vehicle For A Long Time : Once you pay off your car loan – which is often a 48- to 60-month term, you own the car. It’s an asset you can use toward trade in value on another new car or continue to drive payment free. You Want to Customize Your Car : Some people just like to add extra features to their cars – like specialty tires. If you lease a vehicle, you have to remove any modifications or customizations you make to the car. Buying : When you buy a car with a loan – you fully own the car at the end of the loan agreement. Leasing : You do not own the car. You only have the right to drive the car. At the end of the lease agreement, you return the car to the leasing company. You also have the option to buy the car for the residual value stated in the contract. Buying : You put as many kilometres on your car as you need to. Remember – higher kilometres means lower resale value. Leasing : You agree to a limit of kilometres for the duration of the lease. If you exceed the limit, you will pay a per kilometer fee for overages. Buying : You don’t have to worry about wear and tear on your car – except that excessive wear and tear will devalue your car. Leasing : You will pay extra fees if your car shows signs of excessive wear and tear. Buying : You can make any modifications or customizations. You own the car! Leasing : You can modify the car, but before you return it, you may have to change the car back to its original state. Buying : You can sell your car or trade it in whenever you want or need to. You will still need to pay off outstanding loan amount, though. Leasing : In most cases, you will be charged a fee for breaking the lease before the end of the term. The costs can be as high as paying out your monthly payments. Buying : You are responsible for selling or trading in your car. Leasing : You bring your car back to the leasing company. You may have to pay some end-of-lease costs. Choosing to buy or lease is a personal decision. There is no right and wrong when it comes to choosing between leasing and buying. You need to understand the differences between the two, and the pros and cons of each to make sure you are making to correct decision for you at this moment – financially and logistically. When you’ve done your homework on leasing and buying, and when you have clarity on your preferences, you will make a decision that is best for you.